FRESH OFF THE BOAT and SPEECHLESS ended their seasons quietly. ABC: The season finales of FRESH OFF THE BOAT (0.6) and SPEECHLESS (0.5) were steady. 20/20 dropped 0.1 to 0.6. 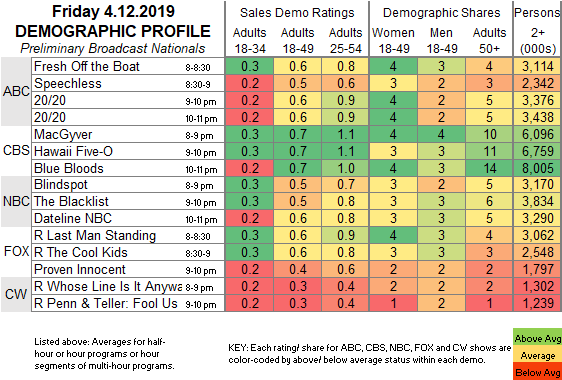 CBS: MACGYVER gained 0.1 to 0.7, but HAWAII 5-0 and BLUE BLOODS were both down 0.1 to 0.7/0.7. NBC: BLINDSPOT was up 0.1 to 0.5, THE BLACKLIST held at 0.5, and DATELINE rose 0.1 to 0.6. FOX: After sitcom reruns at 0.6/0.6, PROVEN INNOCENT stayed at 0.4. Tonight’s primetime is sports-heavy, with NASCAR on FOX, NBA PLAYOFFS on ABC, and NHL PLAYOFFS on NBC. SNL is hosted by Emma Stone, with musical guest BTS. Sunday’s major TV event is clearly CBS’s season finale of GOD FRIENDED ME… aside from the start of the final season for HBO’s GAME OF THRONES.